Disneynature is releasing a gorgeous new film on Earth Day, appropriately called "Earth." I have to admit I was a little skeptical at first. Would it be animated or have a princess? Turns out this film is by the same acclaimed creative team ( Directors Alastair Fothergill and Mark Linfield) behind the award winning “Planet Earth" series. 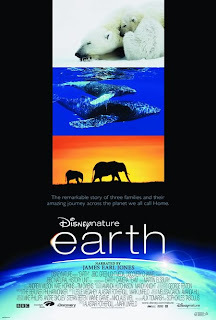 Disney says, "Narrated by James Earl Jones, “Earth” tells the remarkable story of three animal families and their amazing journeys across the planet we call home. “Earth” combines rare action, unimaginable scale and impossible locations by capturing the most intimate moments of our planet’s wildest and most elusive creatures." As a mom with some sensitive young kids, I asked the press contact if the film had any parts which a 3 year old might find scary (like scary music or maybe a baby animal in danger). The film is rated G, but I personally think that isn't always a good enough gauge for very young children. She told me that there is a scene where one polar bear dies, but that it wasn't scary. The film is one and a half hours long. After watching the trailer, I have to admit the footage looks truly spectacular. I don't know how they film some of those shots! From what I understand, the film celebrates the beauty of the planet, and also has a call to action at the end encouraging viewers to care and become interested in environmental affairs. Disneynature has also decided to celebrate the theatrical release of its premiere film by planting a tree in honor of every moviegoer who sees the film in its opening week. Go to the website to see the trailer or buy tickets. This looks cool! May have to be the kid's first movie-theater movie! We took our whole school today K-6. The kids were scared and all of them were sad. My 9 daughter who is very very sensitive, balled her eyes out. She is a total wreck now. There were alot of scarey parts if you ask me. Beautiful footage, but if I had to do it over again, I know that my kids can't handle stuff like that, so I would pass. thanks, lundi. that is good to know. i hope your daughter feels better about it soon.